HAVANA, May 3 2010 (IPS) - Backed by its considerable experience in urban agriculture, Cuba is tackling the challenge of food security through a new initiative that will bring farming to the suburban areas surrounding cities and towns. The idea forms part of a strategy that defines municipalities as key elements in terms of decision-making on agriculture. For each municipality, three areas are contemplated: urban agriculture, suburban agriculture and conventional or rural agriculture. This new model has been put into practice through pilot projects in 17 locations across the island. It is hoped that by the end of the year, it will encompass all of Cuba’s 169 municipalities, according to Adolfo Rodríguez Nodals, head of the national urban and suburban agriculture movement. The essence of this new approach is to bring food production closer to the urban areas where 76 percent of Cuba’s 11.2 million inhabitants live. It is based on the principles of crop diversity, environmentally sound practices, and the use of animal traction to keep fuel consumption to a minimum, the official said. The programme is structured around small farms, most of which are organised into some sort of cooperative structure, mainly Credit and Service Cooperatives (CCS) or state farms. Individual farm owners will work their land with the help of family members, but are authorised to hire outside workers if necessary. ENVIRONMENT: Where Farm Meets City, Hello Sty-Scrapers! Rodríguez Nodals estimated that there are around 600,000 hectares of land available throughout the country for the suburban farming initiative, which will also contribute to the creation of “green lungs” around cities and the reforestation of river and stream basins, in addition to increasing food production. Although the project is in its first stages, some farmers are already singing its praises. “There are greater benefits for both the general public, which will get products at lower prices, and for the farmers, since the more they produce, the more they sell,” Juan Reyes commented to IPS. Reyes and his family work a three-hectare farm that is one of the first to be incorporated into the pilot project in the municipality of Cotorro, a Havana suburb. Cotorro has a population of close to 79,000 and just over 4,000 hectares of land available for suburban agriculture. The crops grown there include garden vegetables, root vegetables and legumes. For inclusion in the programme, each municipality must draw up a project specifying the area available for raising crops and its own food needs, among other details. The suburban farms will be located roughly 10 kilometres outside provincial capitals and four or five kilometres outside municipal capitals. In the case of towns or around 1,000 inhabitants, farming areas will be roughly two kilometres away, Rodríguez Nodals explained to a group of journalists following a tour of the suburban agriculture operations already underway in Cotorro. The experience gained here will serve as a model for the other municipalities that make up the Cuban capital’s metropolitan area, which has a total population of 2.2 million. Another key aspect of the programme is that the state-run sales outlets for suburban agriculture produce will be no farther than four or five kilometres from the farms, since it will primarily be transported by animal-drawn carts or three-wheel vehicles. This poses the challenge of ensuring that the crops reach consumers quickly and in good shape. The programme recommends that local governments seek marketing alternatives that allow for the greatest possible coordination among agencies such as the Ministries of Finances and Prices, Domestic Trade and Public Health, to ensure the “rapid and efficient flow” of food production to the public. A state enterprise will be established in each municipality to organise the provision of services to these suburban farms, ranging from workshops for the manufacture and repair of farming implements, phytosanitary inspection and the supply of seeds to small-scale industrial processing of food crops, among others. Similar to urban agriculture, its forerunner, suburban agriculture is organised through sub-programmes that encompass, among other aspects, livestock raising and animal feed production, training and technology, soil conservation and enhancement, water management, and agro-ecological pest control. 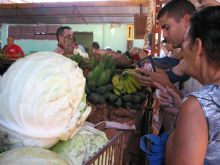 During the first quarter of 2010, a total of 362,608 tons of vegetables were grown in urban gardens and farms throughout Cuba, and it is hoped that total production for the year will reach close to 1.2 million tons. Urban agriculture employs around 300,000 people and uses no chemical fertilisers or pesticides. The government is eager to cut back on the millions of dollars in food imports needed annually, which is why it has pursued a number of strategies to boost domestic production. These include granting the use of idle land free of charge to those who are willing and able to farm it. This particular measure has yet to yield the results hoped for, however. Economists believe that an agricultural “great leap forward” will require “liberating productive forces” — a mix of privately owned farms, cooperative farms and state farms — so that producers can decide what to grow, who to sell it to and at what price, and also have the possibility of purchasing inputs directly. These same sources add that the measures adopted in the sector up until now lack a systemic approach that encompasses the entire food production chain, from the fields to the family dinner table, and its linkages with other economic areas and activities.